Providing you the best range of stainless steel angle 304l and stainless steel angles astm a182 with effective & timely delivery. Manufactured with best quality of Stainless Steel Angle 304L, our range of angles channels is durable enough to withstand high temperature and pressure. These angles and channels are widely used in petrochemical industry, construction industry etc. Our expertise enables us to fabricate a broad range of Stainless Steel Angle ASTM A182, which are manufactured using top grade steel. These angles find usage across construction sector. 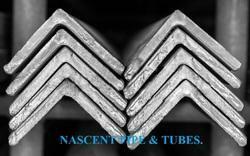 We also have angle channels that are hot rolled, solution annealed, pickled and straightened. These angle channel steel round bars are widely used as machined components, pump shafts, valves, fasteners and machine tools.